I am Jamie Hand. I’m glad you’re here – enjoy, and have a great day! I’m a computer scientist, problem solver, and artist. In February 2017, I graduated from Middlebury College, and in July 2017, I’ll be starting with Google as a Technical Solutions Consultant. I am excited about this role because it will use my skills in software development and technical problem solving, alongside my skills in understanding and working directly with stakeholders. Also, it’s a rotation program with a small cohort of 14 others, and that means I get to explore multiple roles while growing with a close community. What’s not to love? In the summer of 2010, I first experienced the joy of teaching a computer to do something in a robotics workshop at the Glenville State College NASA Research Academy. We used sensors to direct the robot through an obstacle course! Little did I know then, but that was the first of many computer programs I would be designing. 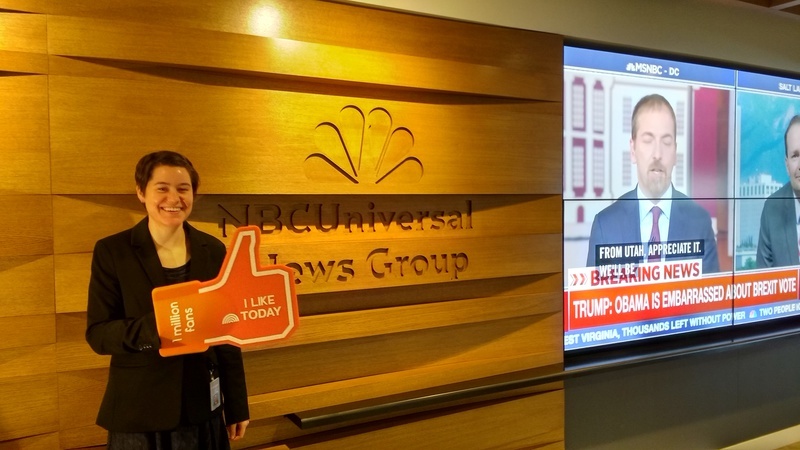 Now, I am a software engineer, and I am excited to have been a Media Tech intern with NBCUniversal’s News Group in summer 2016! In the internship, I developed a Slack bot in Node.js to help streamline the code release process for NBCNews.com and Today.com. I also collaborated with fellow interns (remote and in Seattle) on an innovation project and presentation that won among several other intern groups. I took a year off after high school to live in Brazil as a Rotary Exchange Student. I used my first two years of college as an experiment to see what I wanted to major in – I considered Political Science, Economics, Biology, Math, Japanese, Sociology, Religion, Portuguese, and Spanish, then – finally! – Computer Science. In the middle of my college career, I took a semester-long break, which I spent exploring things like living life slowly, being part of a band (I play violin and sing! ), and learning how to cook. I am working toward a better world. I’m always seeking ways to live green and work toward a society where everyone thrives. Throughout the past few years, I have become increasingly aware of injustice that occurs based on race, gender, sexual orientation, self-expression, physical and mental ability, age, class, size, geography, and other factors. There are systems in the world that benefit some people to the harm of others, and I am committed to working within myself and within the communities I inhabit to give all people access to the recognition and resources that they need to thrive. So far my work in this has been mostly in encouraging diversity in the field of technology. I have participated in several groups for women in technology, including as a founding member of Middlebury College’s Women in Computer Science ++ and participant with Girl Develop It and Charlottesville Women in Tech. I was also a Computer Science tutor at Middlebury, and I continue to informally mentor fellow technologists, and to participate in two mentorship groups. As mentioned above, I also am passionate about living lightly on the earth. The zero-waste movement excites me, as do Transition communities, veganism, composting, buying used/secondhand, and buying local (and only buying things I truly need). Everything intrigues me, and I want to understand it. I have volunteered for audio/video at a conference, interned at a shelter for immigrants, interviewed 24 alumni of an international graduate school, submitted payment vouchers for a lawyer, washed dishes at a restaurant, and helped set up meals for conferences. I watch YouTube videos and listen to podcasts on tech, problem solving, web design, personal branding, feminism, racial justice, self-care, workouts, and whatever else catches my eye (including the occasional cat video). All of these teach me more about myself and about the world (okay, maybe not the cat videos – but they do bring me joy). I especially enjoy learning about sustainable living, entrepreneurship, public speaking, branding, design, the technological systems that make our world work, and new ways to approach problems. I also love to listen to people talk about their interests – to learn why their passions matter to them and what I might want to know about those areas. I look forward to learning from whatever comes next! Bonus fun fact: I <3 documentation. Starting with my first internship in summer 2013, I have complemented every large project I’ve done with thorough documentation of my work, explaining my process and providing next steps for the person taking over the project. This includes my Slack bot for NBCUniversal News Group’s releases (summer 2016), the start of the Open Science Framework API wrapper (summer 2015), and two alumni surveys for Future Generations University (summer 2013 and spring 2017). You can read more about the Slack bot and API wrapper on my projects page.